Being very much a critter person, I wanted to build an orb web as realistically as possible... none of those black webs or drooping lines. In one of my books, it shows the entire process of a spider building an orb web, so that became my 'how-to' guide. The web is made of white yarn. For the orb part, since I wanted to string one continuous spiral, I tied the spiralling yarn to the supporting lines with thread. Simple enough! The orb is about 20 feet in diameter, and I left long lines on the outside to make sure it'd reach from one side of our roof to the other. The white yarn showed up great outside at night! Plus, it looks great under blacklight. Since our roof is flat, with parapet walls, we just tied the supporting pieces of yarn to bricks and set them behind the walls. It was quite secure; the web survived some pretty heavy wind, and stayed up with no problems throughout October. You'll probably need two skeins of yarn for this project. Follow the instructions for pulling the yarn out... trust me, if you don't, you'll end up with one unholy tangle! A shot of the full web in the daytime. The full picture shows it much better than the thumbnail does. 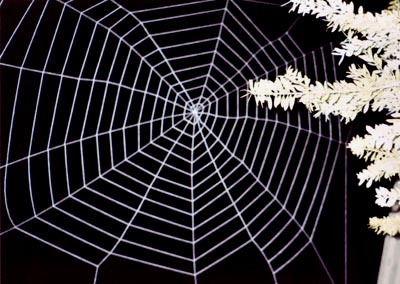 A 'how-to' guide from the real experts on spider web construction. I taped the supporting yarn pieces to the living room walls in this pattern, and worked from there. The big web got a lot of compliments, all through October. I discovered that the spiders themselves even liked it; they built smaller webs between the strands of the big one!